I can write a book about the duffel bag. Its history starts a long time ago and it has always been used by brave men, who were ready to travel thousands of miles, with their lives packed in a duffel bag. 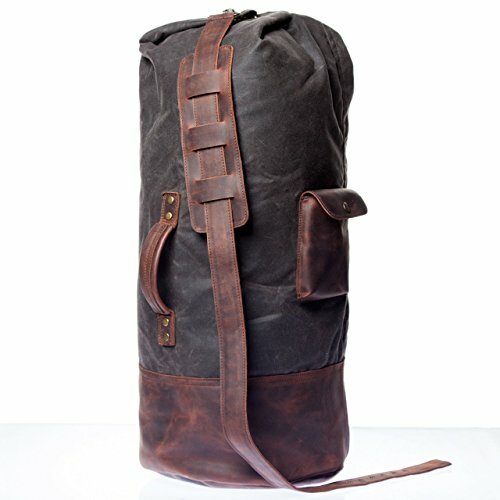 Not many people know that Duffel is a city in Belgium and it is the place where this cloth was originally made. It's very close to my home, but unfortunately there are not so many factories left to produce the famous duffel canvas. The fabric I use to make my bags is from an old British factory, who is producing this waxed cotton for over 100 years. It is a large bag and you can put many things inside it. My source of inspiration was the original US Military Duffel bag, from which I kept the structure and I reinforced the bottom, the handler and the strap with the saddle leather. The result is outstanding! To preserve the character of the fabrics and to make them last longer, I waterproofed the leather and the lining. Together with the waxed canvas, they make an amazing tote bag, ready for a long walk on a rainy day. The diameter is aprox. 30 cm/ 12'' and the length is aprox. 55 cm/ 21" (closed). Perfect as a cabin bag. If you have any questions about this product by Tram 21, contact us by completing and submitting the form below. If you are looking for a specif part number, please include it with your message.